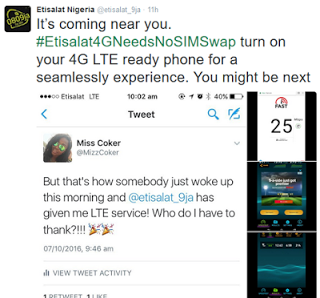 Etisalat 4G LTE Network is now made available to some cities in Nigeria. The speed is like that of light in connection, when connected to smart devices. Although we are yet to uncover some of the cities that this 4G LTE is available at the moment. For now it is tested and trusted that Etisalat 4G LTE Network is working live in the city of Lagos found in Nigeria. Now, you need to be techy in testing this very Etisalat 4G LTE whichever area you are at the moment. As a technician, you need to report back to us using the comment box below on what result you got from observation. 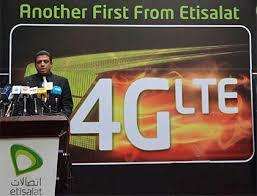 Now the expected outcome of the result should base on whether the Etisalat 4G LTE Network is available in your area or not without leaving behind the name of the place you tested it on. This means a lot to us. We appreciate in advance. √ Updated: Etisalat Easylife 4.0, Make Call At 11k/s To All Networks. √ Updated: Etisalat TalkZone Tariff Plan, Make Call At 12kobo Per second. √ Updated: Features Of Etisalat EasyCliq Tariff Plan. The trend about this 4G LTE was officially announced by Etisalat telecommunication Network via their Twitter handle. Which do you think is leading between MTN, Etisalat, and Glo, not leaving Airtel behind?